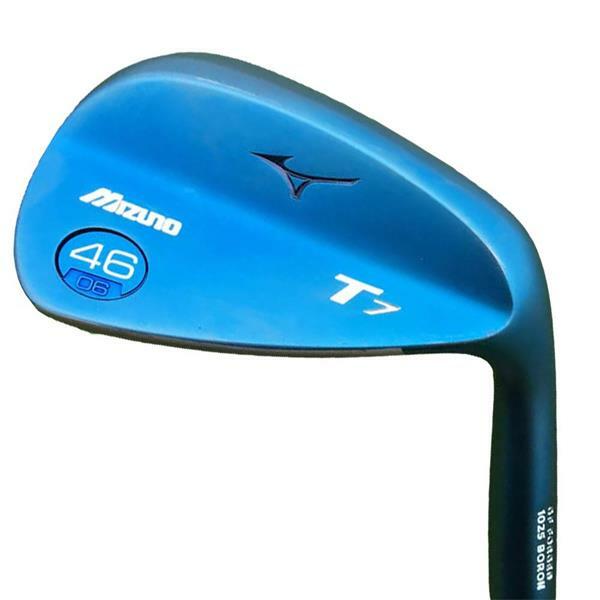 The T7 wedge increases the reliability of our precise Grain Flow Forged heads with longer lasting spin control. Forged from a single steel billet infused with trace amounts of Boron, the T7 boasts a more durable groove than normal forged wedges. The teardrop shaped profile drops all the way down to a 45 degree for full shots – ever more popular amongst professional and elite players. A wide shallow groove on higher lofts (54-62 degrees) and a deeper narrower groove on the lower lofts (45-53 degrees) are designed to maximise spin from both full and partial shots. A straight leading edge and topline for fuller shots (45-48 degree) matches a normal pitching wedge profile. Graduating into a more rounded profile in higher lofts (58-62 degrees). A new, more precise milling tool means our tolerances are even tighter – so we can take our loft specific Quad Cut grooves even closer to the absolute USGA / R&A limitations. Higher lofted wedges boast more visible grinds, effectively narrowing the sole for crisp ball striking from a variety of situations. Blue IP is a stunning finish that will wear away gently over time to reveal the durable chrome layer beneath. Shaft, grips and set up can be matched to your Mizuno custom irons, to maintain a flow through the set – as recommended by our Fitting technicians. At Mizuno’s exclusive plant – manufacturer of Grain Flow Forged heads for Mizuno for over 30 years. See how each Grain Flow Forged iron is made in our forging story.